Jack, the Miller’s son, has been left with just the family cat in his father’s will and although he has great ambitions it is unlikely he will amount to much! Things soon change with the arrival of his Auntie Hettie and the revelation that Puss can talk (and looks pretty fetching in a pair of boots)! Soon Jack, Auntie and Puss are embroiled in a complex scheme to persuade the King and Queen that Jack (aka. the Marquis of Carabas) is suitable husband material for the beautiful Princess. But first they will have to contend with a jealous noble suitor, a pair of dastardly henchmen, and a gruesome, villainous, shape-shifting Ogre! Also available with this script as an optional extra: Rehearsal / performance arrangements for the suggested songs from the show, available to purchase from Lazy Bee Scripts. 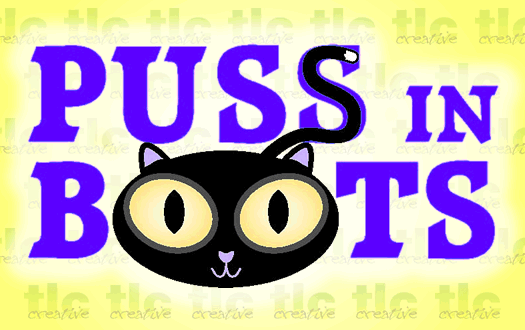 ‘Puss in Boots’ had us in hysterics from the offset which is one of the criteria we use when choosing our pantos. We are now in our 31st season and have tried so many different scripts, in house, traditional and modern and have to say that yours is one of the most inspiring I have come across. Out of 10 definitely 10. We were so pleased with the direction, song suggestions and in particular the way the whole thing was pieced together. It flowed so well.